These are early Spring pictures taken at the Block Island Ferry pier in Galilee, RI. This ferry must be used for off season to travel to Block Island. The one that we rode on during the summer was much bigger, and packed with people. It's about an hour's trip from the pier in Galilee to Block Island, because the island is 10 to 12 miles away. It's a lot of fun, like you're on a cruise or something. If the weather is unfavorable, they have comfortable booths and a snack bar inside. If you take your car over on the ferry, it is best to have reservations during the summer. We went in the off season and didn't need reservations. When we pulled our car onto the lower level of the ferry, one whole side was filled with bicycles belonging to people who were going to Block Island just to ride around. 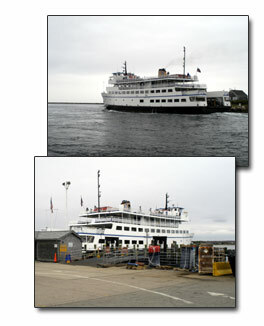 The ferry leaves daily from Galilee, Rhode Island and New London, Connecticut. Is there a Newport to Block Island Ferry? Not to our knowledge. Update: I recieved an email from Tanya. She says, " Your site states there is no ferry to BI from Newport. Not true. Seasonally, it leaves Ft. Adams(Newport) at 9:15 and leaves BI about 5pm every day." Thanks Tanya for sharing this info with us.